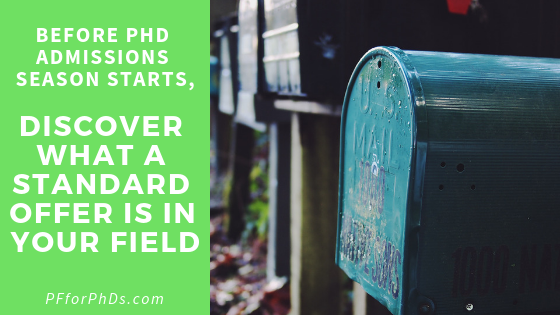 At this point in the year, you should be (nearly) done preparing your PhD program applications and looking forward to receiving at least one offer of admission. Congratulations on your progress! If you haven’t already, this is the right time to fully investigate what a standard offer of admission looks like in your field and particularly at the caliber of universities you have applied to. That way, when your offer letters arrive, you can tell which ones are up to the standard and which aren’t. You can also begin to form an idea of what the time management and financial sides of your life will be like during your PhD. My PhD is in a STEM field (biomedical engineering), and my understanding when I was applying to programs was that I would be fully funded for at least 5 years. This is common in well-funded STEM programs, but more hit-or-miss in other disciplines and at programs struggling for sufficient funding. However, when I was applying I didn’t understand that the source of my funding mattered quite a lot to how I would actually spend my time in graduate school. I wasn’t very discerning regarding that aspect of my funding offers, so this article encourages you to do a better job than I did preparing to understand your offer letters and investigate the funding norms of the programs you’re admitted to, especially for upper-year graduate students. What Does It Mean to Be Fully Funded? Have you ever heard, “You shouldn’t pay to get a PhD” or “An acceptance without funding is a rejection”? These statements are valid for many fields (e.g., STEM), but not necessarily all. If you are in one of the fields where it is common to (partially) self-fund or need an outside job, you need to know that to have realistic expectations of your offer letters. If you are in a field that is supposed to fully fund students, you know that offers with partial or zero funding are not ones worth accepting (even if that’s the only type you get!). What it means to be funded can also vary by field and institution. It’s quite rare to receive an open-ended guarantee of funding as the programs want you to progress toward graduation at a reasonable pace. It’s important to find out if the typical course for a PhD student in the programs you’ve applied to is to be funded until graduation (after a reasonable period of time, even if it’s more than 5 years) or if funding becomes difficult to secure later on in the PhD (e.g., there are 10 funded positions but 15 students competing for them). While ideally you would accept only an offer of full funding, in some fields that isn’t a norm, and you might not get a PhD in that field if you held out for that. But the other side of the coin is that in fields where full funding is typical, you shouldn’t attend a program that can’t or won’t offer it to you. Either the program is under-funded or you aren’t their priority. Do Graduate Students Take on Outside Work or Debt? A corollary to the above discussion about the degree of funding offered is how students pay for their lives (and tuition and fees) if they don’t receive full funding. Do graduate students sometimes take out student loans, and if they do is it to pay their tuition and fees or to pay for living expenses? You may find variations in these norms across the programs you are accepted to, even within the same field; this is a more difficult subject to investigate, but a very important one. Even if a program tells you that you will receive a year-round stipend all through graduate school, the students will be able to tell you if that stipend is livable or if they are turning to outside work or debt to supplement it. What Do You Have to Do to Receive Funding? There are two sources of money for stipends: fellowships and assistantships. When you are granted a fellowship that pays your stipend (or you might be on a training grant), you have officially “no work expectation;” you are free to pursue your classes and/or dissertation with all of your time. An assistantship that pays your stipend, on the other hand, comes with a work expectation between you and your department/university. An assistantship to receive a full stipend is generally 20 hours/week, but some assistantships offer fractional pay for fractions of that time. There are a few variations of assistantships that are important to distinguish among. A teaching assistantship requires you to teach or assist a faculty member in teaching a course. Research assistantships require you to do research under the supervision of a faculty member; this research could become part of your own dissertation (more common) or be separate from it (less common). Sometimes assistantships are for other types of service around the university, such as an administrative role; these might be labeled graduate assistantships or similar. It is imperative to know what kind(s) of work requirement is typical for your field to evaluate your offer letters and have realistic expectations about how you will use your time in graduate school. It’s not uncommon for graduate students to receive funding from different types of sources throughout their PhDs, so don’t assume that because you were offered a fellowship in your first year that it will necessarily continue. In particular, how are students funded once they are finished with classes and ready to sink into their dissertation research (e.g., have achieved candidacy)? What Is the Time to Degree? A question for the programs that have accepted you is: What is the average time to graduation? (Bonus: What is the standard deviation?) Make sure that the answers you get from the programs are in line with recent averages in your field. While a shorter average time to graduation is attractive, make sure it’s because students are actually graduating on time and not just being kicked out for failure to progress if they take too long. If the average is longer, ask how students support themselves after the fifth or sixth year: Are they still funded or are they on their own? Having a baseline of knowledge of what funding packages are standard in your field will help you immensely to read and understand the offer letters you receive. If you are a current graduate student, please report your field and what a standard offer of admission is in this anonymous 6-question survey!